I think just writing about my sewist's block helped me get past it. Who knew this blogging thing could be so helpful? Here's the results so far. I decided to add pockets but you can't really see them and I forgot to take a close-up. I couldn't be happier with the fit. Unfortunately, once I pleated out the droop below the bustline, I think I made the front too short. It doesn't hang at the same level. You can see that in the side shot. I'm off to bed. Tomorrow evening I will attend the lecture part of the Bra Making conference and all day Tuesday I'll be attending the hands on portion of the conference. My next post will probably be showing you my new bra. I can hardly wait. Anyone know why this happens? I'm all ready. 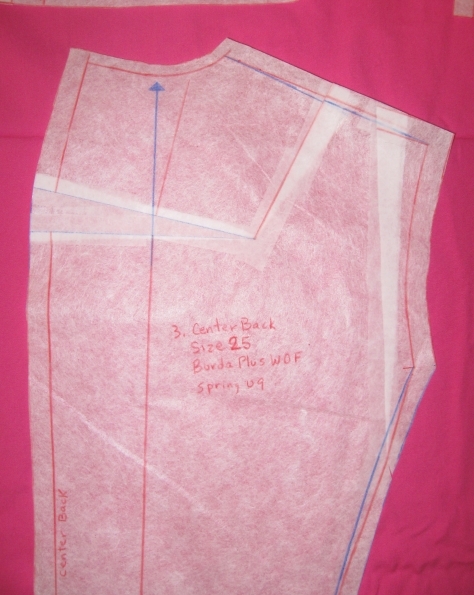 I have the pattern done, including remaking the lining pattern. But instead of doing my block fusing and cutting, I'm reading. I'm reading everything I can get my hands on how to sew up a lined jacket. I've done this before. I've taking a semester long tailoring class. I know how to sew a jacket. However, the tricky part is heming a lined jacket. I've read everything I can find on it, and now I think I can even do that. So, why aren't I fusing and cutting? I feel paralyzed. Does this happen to anyone else? BTW, I found some buttons for my jacket and I may decide to do some decorative running stitches to define the edges and princess seams on the jacket. I only have today and tomorrow morning to sew on the jacket. I don't think I'll get it done by then, but again, I don't leave for NY until next month so I'm sure I'll get it done before I leave. I've been listening to Carolyn blog about how it is she can sew an entire outfit, or at least a garment, on the weekend. Her method is to have everything ready so she can just sit down to sew. To that end, today I'm getting all those pesky details out of the way so I can just sit and sew my jacket tomorrow. Only interruption I'll have is my appointment at 8 am to give blood. After that, I'm going to go out to breakfast. Going out to breakfast used to be a favorite past time before I started taking care of myself. Now I may just order oatmeal with real cream and brown sugar, but one needs not entirely forgo the things that make us happy. Anyway, I've been studying the pictures of my last muslin and I still see problems. Really, I'm not as OCD as others are about wrinkles, but this one is an easy fix. See how the fabric is collapsing under the bust at the princess seam? That is bothering me. So here you can see the fabric pinned out. I think it looks much better and all it will take is for me to cut and overlap the front and side pattern pieces. As for the sleeve, what I think I'll try is a combination of lowering the sleeve cap and overlaping the sleeve to take out some of the 2" of cap ease. Kathleen Fasanella believes that there should be no ease, I tend to like some, but not 2 inches. I'm also going to make it a long sleeve. I've selected some winter type fabric from my stash. It's an olive/grey tweed and I found some satin backed poly textured fabric for the lining. While the lining fabric doesn't exactly match it doesn't clash either and the best part is it is all from the stash! I'm toying with the idea of an interlining since I'm making it for my NY trip. However, I will be wearing an overcoat too, so maybe I won't. Did I just talk myself out of an interlining? These buttons were in my stash as well. I don't like either but if I had to choose, I'd pick the ones on the right. Unfortunately, I can only put my hands on two of them. I'm sure if I keep on searching, I could find at least one more. I'll probably go buy some instead. After all, I do need to do my part to keep the economy running. When I get back from NY, I am planning on making the jacket again for spring in this stretch cotton toile. It's been aging in the stash for quite a while. I also have some red denim that would make a great pair of jeans to go with this jacket. All I'd need is a white t-shirt, and I'll have a great spring outfit. I'm definitely going to have to do something about the sleeve. I think I'll steal one from another pattern. I'm not sure which one yet. Maybe the two piece sleeve isn't for me. However, I'm liking the princess seam instead of the dart. This fabric is awful to work with. I haven't decided what the final one will be, but I'm still considering the red/white toile. I'm much happier with the back. I'll just let it out a tiny bit in the center where it's pulling and then I'm calling it good enough. The side looks really pretty good, except for the sleeve, of course. Tomorrow I'll go hunting for a new sleeve, do a muslin and then I'm ready for the real thing. I can't wait to get the jacket made. I got the second muslin done. I really like the way the front turned out. It fits extremely well with my alterations. However, I can't seem to eliminate the pointedness at the dart end. I think it may just be the nature of this type of fabric. So I'm considering making this an armhole princess seam to match the armhole princess seam in the back. Then I can eliminate the pointed dart. If I do that, then I will eliminate the side waist seam. Unfortunately, that seam is one of the reasons it's such a cute pattern. 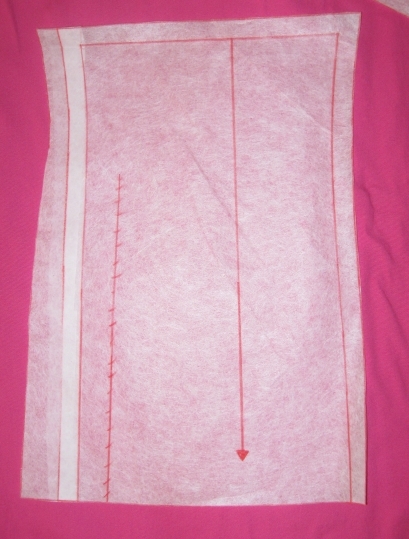 For the pink muslin, I did a high rounded back alteration and eliminated the dart. That alteration was a big mistake as you can see in the photo. It gave me a sort of camel hump and raised the neckline way too high for me. Then I recut the back eliminating the high rounded back alteration and put the shoulder darts back in. The neck is still a tad too high, but I can always cut it down when I cut the real fabric. The problem I see and still need to eliminate is the way it collapses in the back behind the armhole. 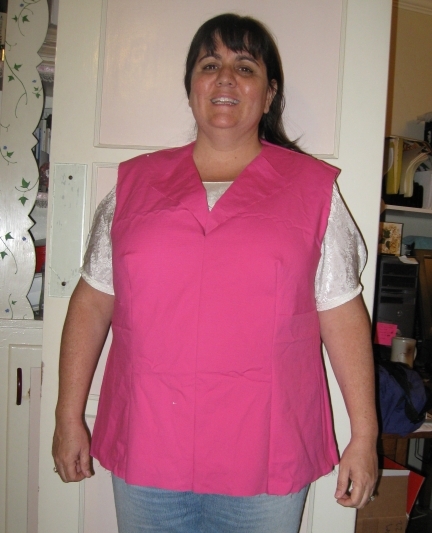 Tomorrow I'm taking it to work and having my sewing friend see if she can pin out the excess fullness. The side looks really pretty good even on the camel hump version. I'm happy that I got enough circumference for my body without major alterations. You can see in the next photo how I got the circumference. I added 1/2" to the side seam near the armhole and then went to 1" at the waist down through the hip. I also had to do this to the rest of the front side seam on the front pattern piece and on the back side pattern pieces. The biggest problem I saw on the first muslin was that the shoulders were too wide. Also, there was too much in the upper chest area. What I decided to do instead of just cut off the excess was to cut a line to the dart and overlap 3/4" to make the narrow shoulder adjustment. I also cut and overlapped in the back. The blue lines are my seam lines trued up and the grain line trued. This picture was taken before I removed the rounded back alteration. Well, am I ready to cut the good fabric yet at 2 1/2 muslins? I got up at 5 am today. I couldn't sleep anymore. Husband came to bed and woke me up and I was ready to, um, talk. He was ready to sleep. He won so I got out of bed and sewed up these pants. I would have got the other pair done except I started watching Hell's Kitchen rerun downloads. It was fun, but quite the time waster. The other thing I did today was to take Son to an audition for the play, Annie. I know I've mentioned in the past that Son has Asperger's Syndrome. That means that he is a very high function Autistic. However, he has outgrown almost all his Autistic tendencies. That is, he has learned appropriate social behaviors since they aren't innate in Aspies. I've never been to an audition in my life. Luckily I ran into someone I knew there who had. After asking many questions, she suggested I go home, get something to eat for Son and myself and I also picked up his hand held video game and my CD Walkman and a book on tape. We were there from noon until 4:30 pm mostly waiting around. The great news is that DS was cast as a mobster. This is a really big deal for us. He had to sing and dance on stage by himself. He doesn't know how to sing or dance. His singing was really pretty good for someone that's never sang before, but he didn't learn the dance steps very well. I'm very excited about this because it means he gets to meet girls. He goes to an all boys school and doesn't even know any girls. At 14, it's time he met some and learn how to interact with them. You can probably expect to see some blogs of me working on costumes. They make the parents volunteer in some capacity. Costumes seemed logical for me. 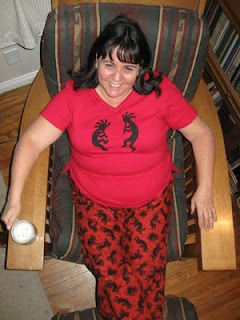 When we got home from the audition, I found a Kokopelli picture on the internet. After putting it into Paint and changing the picture into a line drawing, I traced it on heat N bond. Next I pressed the HnB to some black quilting cotton and appliqued it to my T-shirt. Then I zig zagged around it. I don't think my ZZ turned out very nicely. You see, my machine decided to call it quits. Luckily, Twin Sis, Carrol let me borrow her Bernina 930. However, it doesn't have an open toe foot so I couldn't see where I was going as I went around the appliques. Since these are only PJs, I don't mind very much. Unfortunately, now my neck is killing me from trying to see inside the regular stitch foot. It's been a long day. Tomorrow, I'm going to start back on the jacket. I think I'll take out some of my alterations that made the first muslin too big. I have some red/white toile stretch twill that I think I'll make this jacket out of. Then I can make some red denim pants to go with it. I'm having a blast using up my stash. I'm hoping that, except for my NY trip, I will stay away from fabric buying altogether. I'm running out of room for my fabric collection. When I'm feeling especially large, which has nothing to do with how large I actually am, I always alter up too much. I think I really over did the ease on this pattern. Not only that, but the ugly orange stretch linen from my stash that I used from FFC is way too stretchy. I could probably have made this muslin without any alterations to the original pattern because of my fabric choice. The pattern also has much too much ease in the sleeve cap. I'm not sure how much of that is just the stretchy fabric, but a gathered sleeve cap is not the look I want. 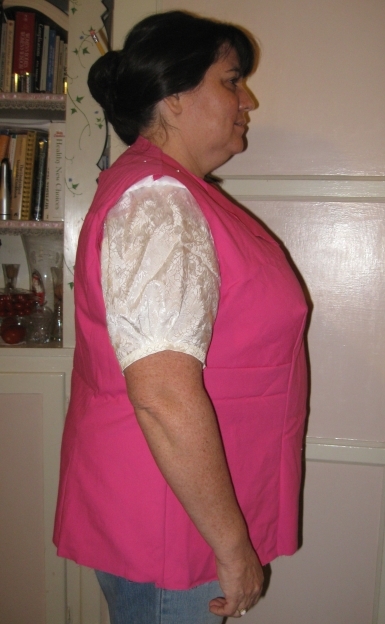 I can see that I need to make a narrow back adjustment and shorten the shoulder length. The sleeves with a 1" cuff will be too long so I need to shorten them and I also need a rounded back alteration. Then another muslin. Stay tuned while I make some alterations and sew up muslin #2. Anyone want to start placing bets on how many muslins this jacket pattern will take? My wanna came back. I got the two PJ pants cut out along with a new CWC knock-off. Today I want to get a pair of jeans and a jacket muslin cut out. 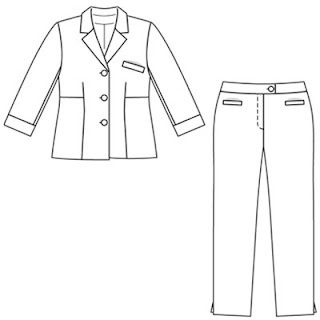 I spent last night tracing the new petite jacket from the Spring Burda Plus WOF. Here's the line drawing. I'm quite impressed on how well this fits with no alterations at all. 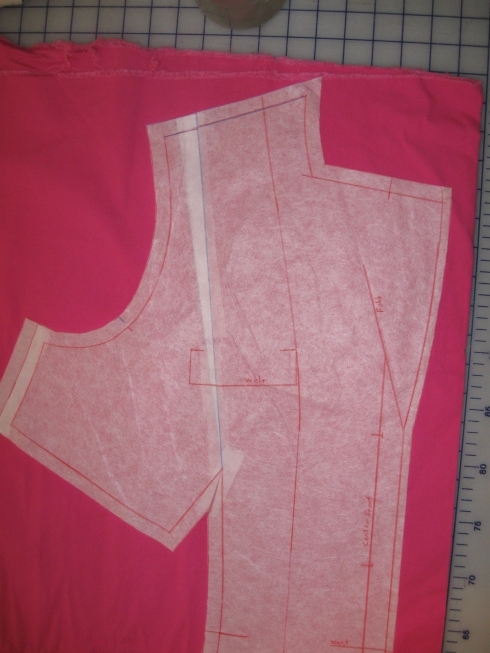 I traced out size 25 which is an American size petite 24. Now I would never ever sew a size 24 in American patterns. It would be huge on me. I'm not sure what's up with the European sizing charts because I don't think the conversion is correct. This fits me more like a size 18/20 would fit except that all the petite alterations are already made. Not my prettiest look since I don't have any makeup on and I haven't even brushed my hair today. There are some alterations that I'll need to do. This is too close fitting, it needs some wearing ease. I can handle this three ways. One is to not alter it at all and wait until I lose a lot of weight to wear it. Two, I can not alter it and use a woven stretch AND wait until I lose a bit of weight, or three, alter it to add more body space for ease. I think I'll chose #3 since I really want to wear it now. The sleeves also need to be altered since they are snug on my arm. However, I need your opinion. Do you think I should go ahead and keep the sleeves 3/4 length on this jacket? The pattern will be a bit more like bracelet length on me since they didn't shorten them quite enough, or should I go ahead and lengthen them for full length? All opinions are welcome. As far as alterations, I can always make it again when I become smaller. Stay tuned for muslin #1 and some PJ pants.